If you’re gonna slice tomatoes do it right. 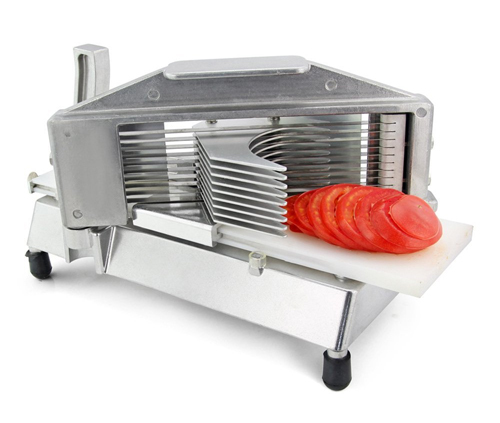 No not with knife skills, but with the New Star Foodservice 39696 Commercial Tomato Slicer, 1/4-Inch . Every slice a quarter of an inch, every time. Mmm, uniformity. Designed for restaurants and food service establishments, there is no reason why you can’t pick up one to go with all your other countertop appliances. Cofeemaker? Check. Toaster? Check. Powerful tomato slicer? Check and mate! Now if they could make something to produce consistent slices of bacon and lettuce for perfectly-sized BLTs each and every time. Produce doesn’t always come in convenient sizes. Sometimes, we just need a bite. Whether you just need a few slices of tomato for a sandwich or want half of an apple as a snack, the unused portion needs to be stored for later use. Produce Savers by Evriholder Products are a set of specifically (very specific) designed gadgets for saving and storing common produce. Available in five distinct styles, the produce savers work by protecting the produce from surrounding air. Place your fruit or vegetable cut side down, and clip to hold in place. The lack of contact to air helps to prevent browning and keep the produce clean. The produce savers are certainly fanciful creations, and at $3.99 each (looks like they were pretty popular at that price! ), they are definitely affordable. And fun too. The Cucumber Saver looks like a cucumber, and the Lemon Saver perfectly imitates the shape of a lemon. Click on through for pictures of the whole set, including the Onion Saver as well as a Tomato Saver . 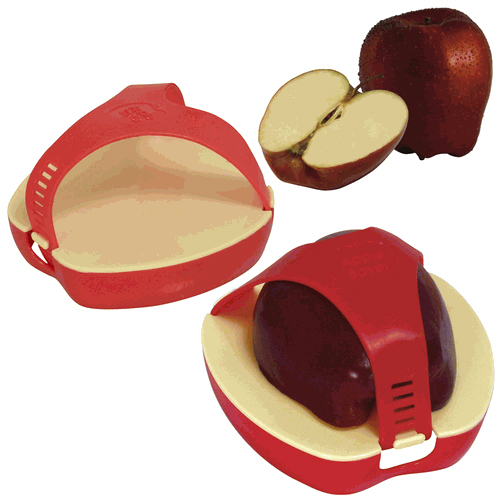 And of course, don’t forget the Apple Saver . Why Wine One When You Can Wine Two?